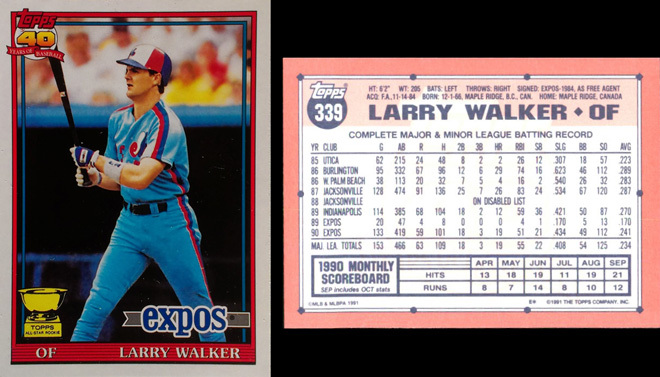 Is Larry Walker a Hall of Famer? Before I begin this analysis, I'm going to stipulate that it will only deal with performance on the field. I don't know whether Larry Walker used PEDs, and I'm not sure I really care. The term PED means "performance-enhancing drugs," and steroids are just the most modern form. Willie Stargell loved his amphetamines. Even the sainted Hank Aaron had to admit in his autobiography ("I Had a Hammer") that he once took an amphetamine pill before a game. Before the age of drugs, there were plenty of other forms of cheating. Hitters used corked bats. Pitchers like Gaylord Perry cheated their way into the Hall of Fame with all kinds of shenanigans. Rogers Hornsby told True magazine in 1961, "I’ve been in pro baseball since 1914 and I’ve cheated, or watched someone on my team cheat, in practically every game. 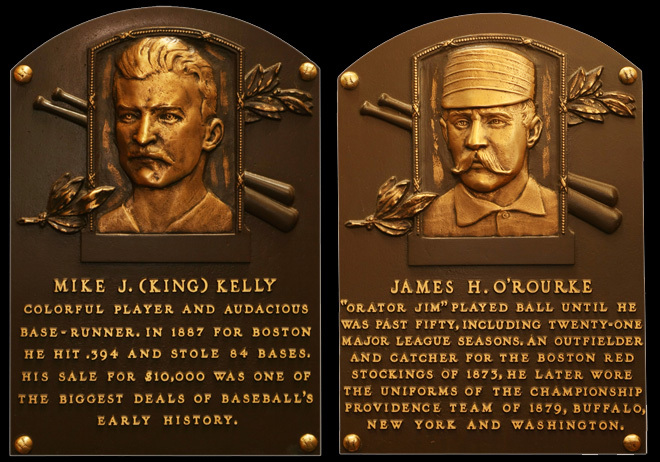 You’ve got to cheat.” King Kelly and John McGraw practically invented baseball cheating, and their plaques are in the Hall of Fame right next to the straight shooters. So you guys debate that issue amongst yourselves. I'm only going to address what Walker accomplished, not how. When I started to assemble this data, I was predisposed to think that Walker didn't have the right stuff. After all, his creditable lifetime numbers are heavily influenced by the time he spent at Coors Field, and he owned that joint. In 1999, when he ripped National League pitching for a career high .379 average, the fourth highest batting average since Ted Williams retired, he batted only .286 on the road, with a measly 11 homers. He batted .461 at Coors that year, with 26 homers and a 1.410 OPS. That kind of information led me to believe that Walker was vastly overrated. After having considered the matter in more depth, however, all the while trying to keep my mind open and my eyes on the big picture, I now believe that Walker is a legitimate candidate for the Hall. 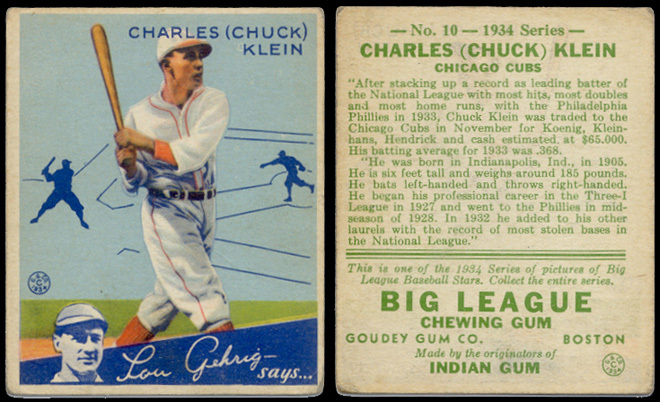 Consider three men with similar levels of achievement: Larry Walker, Chuck Klein and Duke Snider. Baseball-Reference.com lists Snider and Klein among the ten players most similar to Walker. Snider and Walker are very similar. In fact, Baseball Reference lists Snider as the most comparable retired player. I chose to add Klein to the comparison because he is a Hall of Famer and he, like Walker and Snider, had career stats heavily influenced by one friendly home park. Chuck Klein batted .395 with power at the Baker Bowl, Walker batted .381 with power at Coors, and Snider had a .999 OPS at Ebbets Field. If you look at their career stats, Walker is not only similar to the two HOFers, but actually seems a bit better. The numbers above include everything Walker did at Coors Field, of course, so his lifetime .965 OPS is higher than either Ty Cobb or Willie Mays. I think we all know he was not that good. But the fact that he wasn't really better than Willie Mays doesn't mean he is not a Hall of Famer. If the Hall was restricted to all players as good as or better than Willie Mays, it would be a mighty cozy place. Some might even argue that Willie would be the only member. But Walker still seems to be a Hall of Famer after the effects of Coors are factored out. Walker's similarity to Duke Snider is not just because of Coors. If you ignore what all three of the players above did in their friendly home parks and just concentrate on their performance in all other games, as summarized below, it is only Klein who drops out of contention, while Walker still comes out of it looking solid, and is still virtually identical to Snider in the key hitting indicators. His lifetime OPS outside of Coors (.876) is excellent. Eddie Mathews, for example, is at .885, and nobody would contest that he is a high-tier Hall of Famer and was a great power hitter. 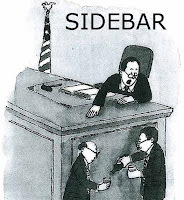 To state my case briefly, I've changed my mind. Larry Walker is almost precisely equal to Duke Snider with the bat. In addition, he was faster and stole more bases than Snider, threw out more runners with a stronger arm, and had comparable range factors on those occasions when he was called upon to play center field. Ordinarily, I would not accept the argument that "X is as good as Y, and Y is a Hall of Famer, therefore so is X" because that argument usually involves a Y who should never have been selected to the Hall in the first place. On the other hand, I am willing to take the stand for any player who is as good as somebody who BELONGS in the Hall of Fame. For example, I'm not willing to state a case for Walker based upon the fact that he was obviously a far better hitter than Chuck Klein, because Klein's credentials are suspect. On the other hand, Walker has a good case in the Duke Snider comparison, because Snider is not a bottom dweller. By any reasonable set of standards, he is an above-average member of the Hall. It's not just a Coors Field issue. Of the three New York center fielders in the famous baseball song, Larry Walker was not as good a player as Willie and Mickey, but he was as good or better than the Duke, who is not only in the Hall of Fame, but definitely belongs there. Therefore, I withdraw any previous objections I have made to Walker's candidacy. I don't consider his candidacy to be a high priority, but his credentials are genuine, even for a Hall of Fame outside of Canada. 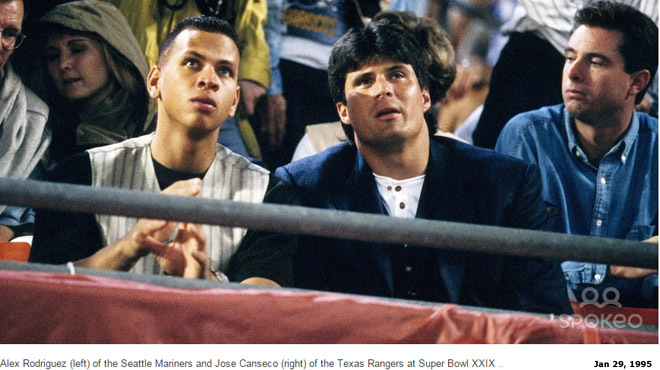 Did A-Rod Start Using Steroids in 2001, or earlier? "If you believe he started using [PEDs] in 2001, when he said he did, you're a fool," a former teammate said. "The likelihood is that he never played a day clean in the major leagues. Why? Insecurity. Alex doesn't know how good he could be without drugs, and didn't trust himself to find out." The statement cited above may be based on pure speculation, unqualified amateur psychology, or hard eyewitness evidence. It may even be completely fabricated from bitterness or jealousy, for A-Rod is not widely loved in the baseball community. We do not know. What we do know is this: if A-Rod started using PEDs in 2001, he somehow managed to find a batch of steroids that made him worse at baseball. His record in road games gives us a reasonably objective overview because it allows us to view his performance on a level playing field. As A-Rod's former teammate said in the citation which began this article, "If you believe (that), you're a fool." Surprisingly, very few analysts have taken note of these circumstances, possibly because A-Rod's overall numbers seemed to improve when he went to Texas. That was deceptive. It happened simply because he started playing 81 games per year in a hitter's haven in Arlington instead of in his previous haunts in Seattle (the Kingdome in 1998 and half of 1999, followed by Safeco in the rest of 1999 and 2000). His year-by-year record of road homers shows almost perfect consistency in those six years: 24-22-28 ... 26-23-21. There is no evidence of a true improvement in performance after Rodriguez signed the contract with the Rangers, just a change of home parks. In my opinion, if he was using PED's in Texas (which he admits), then he must have been using them in Seattle as well. 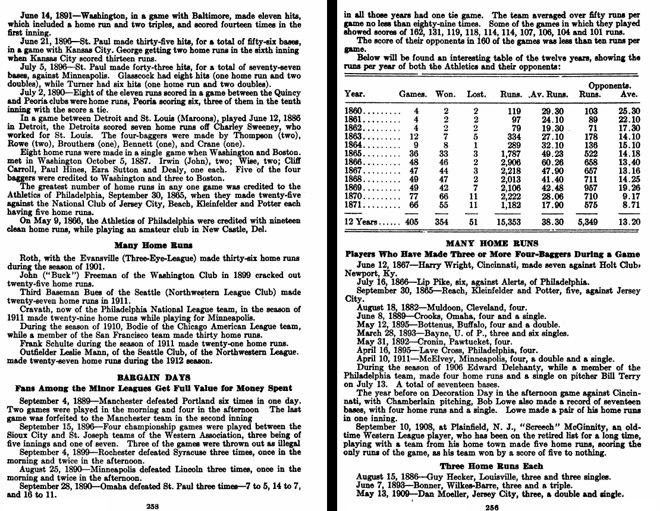 Looking back on it after more than 130 years, it doesn't really matter who won the National League batting championship in 1884, but it's interesting to see how we have approached that topic in our enlightened, data-obsessed era. When that season ended, the "Batting Champion," which in their time meant the man with the highest batting average, was Orator Jim O'Rourke. 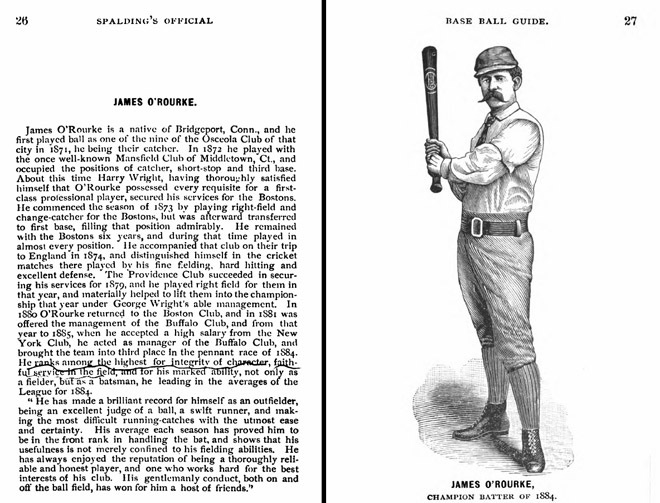 The Spalding Guide not only noted his victory, but also felt this accomplishment was so important that they devoted a page of biographical prose to him, and accompanied it with his image, captioning it "Champion Batter of 1884." The tribute was followed by a leaderboard, showing that James "Orator Jim" O'Rourke had batted .350, narrowly defeating Ezra "No Colorful Nickname" Sutton, who had batted .349. Mike "King" Kelly, although not yet crowned with that title, was third at .341. O'Rourke and everyone else alive at that time went to their graves thinking that Orator Jim had won that title. My 1959 Encyclopedia of Baseball still lists him on top with that average. As baseball researchers became more diligent, however, men started to comb through the old box scores to see if there had been any mistakes, and by golly, there had been a few that year, causing a new king to be crowned, King Kelly I. O'Rourke did finish a point ahead of Ezra Ballou "I Look Like an Accountant" Sutton in the revised calculations, with each of them dropping three points to .347 and .346, but the contemporary tabulations had apparently managed to understate Mike Kelly's average by 13 points, so his upwardly adjusted .354 now tops the list. In a sense it's a shame that Kelly wasn't considered the champ at the time, because it would have been interesting to see what the page of biographical prose would have looked like. You can see that O'Rourke's bio notes that he is a high-minded and responsible man of integrity who helped little old ladies across the street and spent his off-season shielding those adorable baby seals from being clubbed to death. Kelly, on the other hand, was somewhat less of a gentle humanitarian. He was famous for many other things unrelated to his unquestioned superlative ability to hit a baseball. In the off-season he went touring on the vaudeville circuit as a performer. He eventually became the 19th century equivalent of a rock star after he was sold to Boston, where they love handsome and jovial Irish redheads more than just about any other place on earth - and handsome he was! He was also the first ball player to write an autobiography, and is credited with having invented the hook slide, that innovation even having inspired a popular song. But he also regularly led the league in two less desirable categories: cheating and drinking. Many people think that John McGraw and the Orioles of the 90s were the true innovators of baseball shenanigans, but those guys were only refining Kelly's tricks. In fact, the practice of skipping a base when the umpire wasn't looking was referred to in the old newspapers as "the old Kelly trick." One of Kelly's innovations was one we used to use on the schoolyards when I was a kid: the third base coach would get the pitcher to toss the ball in his direction, putatively to check it for defects of some kind, while time was still in, thus allowing the runner on third to score. 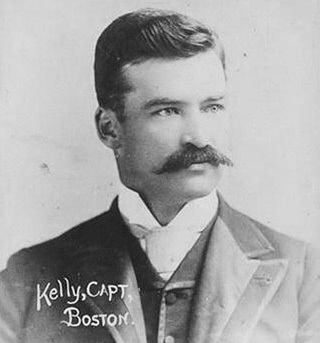 Edward Achorn wrote of Kelly in his book about the 1884 season, "He cheated - frequently, outrageously, and almost unbelievably. As a catcher, he threw his clunky mask in front of runners trying to score, hoping to make them stumble before they reached the plate. As a runner, he readily blocked fielders from making plays; as a fielder, he shoved and tripped men racing past him." Kelly was one of the best base-stealers of his time. I get the impression that was probably literally true. I picture his apartment filled with the bases he stole from every park in the league. Kelly's shenanigans sometimes went beyond mischief. In September of 1882, playing in a critical game against the Providence Grays, Kelly broke up a double play by leaving the base line and punching George Wright in the shoulder as he was about to throw. That understandably upset the Providence manager, even more so because it happened to be George's brother, Harry. Kelly didn't bother to deny having done that, and he actually tried to justify it, basically by telling the dignified Wright to grow a pair because the great Kelly was a professional whose job was to win games, and was doing what he needed to do. 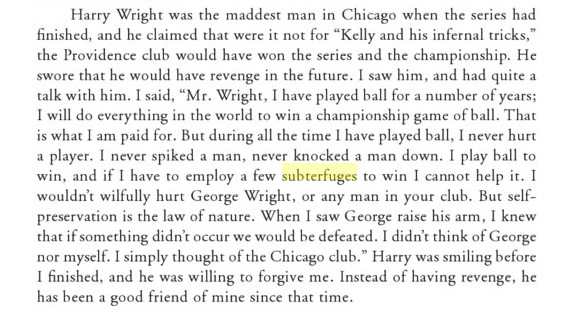 According to Kelly in his autobiography (see below), he talked it out with ol' Harry and they became best buds. That is actually possible, because the King was a charmer, a good ol' boy who was well liked by fans and his fellow players. Most of his contemporaries knew that his skullduggery was just part of the rough-and-tumble game that was played in those days, and that Kelly just happened to be an exceptionally clever guy who was better than most at circumventing the rules. Kelly's drinking was even more impressive than his chicanery. Howard Rosenberg wrote, in his book about the rule-breaking in early baseball: "In 1898, Boston National League Director William H. Conant would recall having paid, around the time of the 1891 payment, a $200 bar bill for Kelly and friends and being forwarded, on a visit to the bar later that night, another Kelly tab for $140." The inflation calculator tells us "What cost $340 in 1891 would cost $9046.05 in 2015." Nine grand! Now THAT is a bar tab. Poor, deposed Orator Jim was nowhere near as colorful or as handsome as King Kelly, and the only big tab he seems to have run up was in moustache wax, which he apparently offset by holding down his spending on combs and hair tonic. He was probably best known for being an excellent speller and flossing regularly. O'Rourke took such good care of his health that he was 39 years old when he achieved his major league highs in hits, doubles, homers and RBI. He batted .360 that year, with 115 RBI in only 111 games. He got his last major league hit at age 53. Two years after that, he came to the plate 348 times in the minors for Bridgeport, in the same town where he was born and eventually died. He played his last minor league game at age 61. He lived another seven years after that and his obituary in the Brooklyn Daily Eagle remarked that he was a sober man who had invested his money wisely and died worth a small fortune. In his native Bridgeport, the local obit noted that in addition to all of his sporting and financial achievements, he had been a kindly father and a splendid citizen. 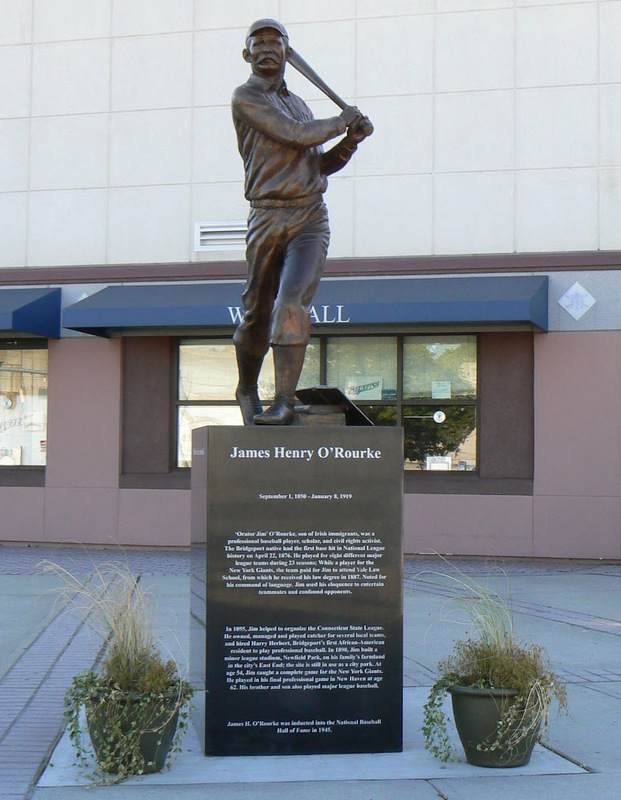 O'Rourke was so beloved in Bridgeport that they built a statue of him (right; click to enlarge). Kelly, on the other hand, had spent his money on whiskey and good times. He died penniless, and he was only 36 years old. So, tough break on that batting championship, O'Rourke. The year of the 180-foot homer. Today's record books all show that Babe Ruth set the single-season home run record in 1919 by hitting 29, thereby breaking the record of 27 held by Ned Williamson. That's not they way they saw things when Ruth was chasing that record. The writers of that era originally thought that Ruth was chasing the record of 25, or possibly 26 (the 1919 sources vary), as set by Buck Freeman in 1899. (Click on the Oct 6, 1919 article to the left to enlarge it and read a typical viewpoint from the era.) In fact, that made perfect sense because there were still fresh memories of Freeman, who was the Ruth of his own generation, a man who lashed baseballs for unprecedented distances with unprecedented frequency, and led several leagues at various levels in four-baggers. Ruth was not only chasing an aggregate number, but a legend, by hitting balls into and beyond locations which only Freeman had previously reached. Freeman had still been playing in the majors as late as 1907, while Ruth had begun his career only seven years later, and with the same team, so many contemporaries of a young Ruth had personally seen an older Freeman, and many Boston fans had viewed long balls hit by both players. Catcher Bill Carrigan, a long-time fixture on the Boston squad, had even been the teammate of both men. The players, fans and writers of 1919 were well acquainted with Freeman and his tape measure shots, and the baseball rules and strategies were essentially the same in 1919 as they had been in 1899, so Freeman was considered the rightful home run king to be deposed. It was only after Ruth had leapt the known Freeman hurdle that sportswriters and sports historians started to dig into the old-time White Stockings, who had amassed an incalculable number of circuit clouts in 1884 because of a freakish combination of circumstances. Oh, sure, the game of 1884 had used a different set of rules, different equipment, and a different pitching distance, but it was still the National League, after all, so writers started to comb through the old box scores. The researchers found that superstars King Kelly and Cap Anson had hit a lot of homers that year, as did three other members of the team. The derby champion was neither of the future Hall of Famers, but Chicago's relatively obscure third baseman, Ned Williamson, who hit 27, after never having hit more than three in any of his previous six seasons. After that year, Williamson played six more seasons in the majors, but would never reach double digits again. Despite the above evidence of his apparently having an entire set of Old Judge baseball cards dedicated exclusively to him, Williamson's slugging record had gone unrecognized for more than 30 years after his having "set" it, but that wasn't really surprising, given that fact that it wasn't even recognized when he did it. Except for the second game of a May 30 doubleheader when Williamson played catcher and clubbed three homers and a double, there was really no significant acclaim for Williamson's prodigious slugging feats in the Chicago papers that year, even though the box scores were dutifully reported and the individual homers noted within them. Below are the Chicago Inter Ocean's summaries and box scores of the season's final two games, which were both played at home. Yes, they were home games, even though Chicago batted first. It was the home team's choice in those days, and Chicago's player/manager Cap Anson liked to mix it up. In fact, the "home team bats last" rule was not enacted until 1950, although home teams seldom chose to bat first in the modern era. In the old days, however, when a single ball might be used throughout the game, many teams liked the advantage of getting the top of the line-up to bat in the top of the first, when the ball was fresher and livelier. At any rate, Williamson homered in each of those games, thus (we now know) breaking a 25-homer tie with teammate Fred Pfeffer for the annual and all-time lead, but he attracted absolutely no notice either for his performances on those days or his cumulative seasonal achievements. 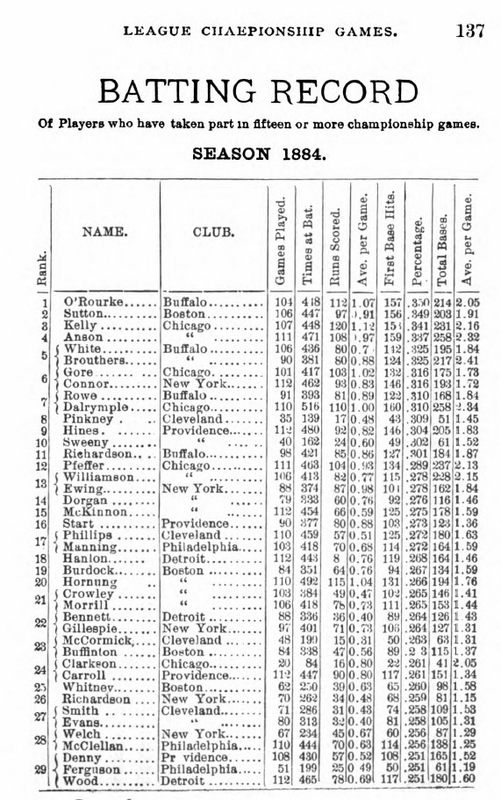 The custom of the baseball guides in 1884 was to list a player's total hits and total bases, but not to break the hits down into doubles, triples and homers, so Williamson's official stats for that year in the Spalding Guide look very solid, but neither that page, shown below, nor any other in the annual guide indicate that he had led the league in homers, let alone that he had established himself as the all-time single season homer king. In fact, his total of 82 runs scored looks paltry, given that five of his teammates exceeded 100! The out-of-town newspapers didn't notice Ned's power displays either, from what I could see. 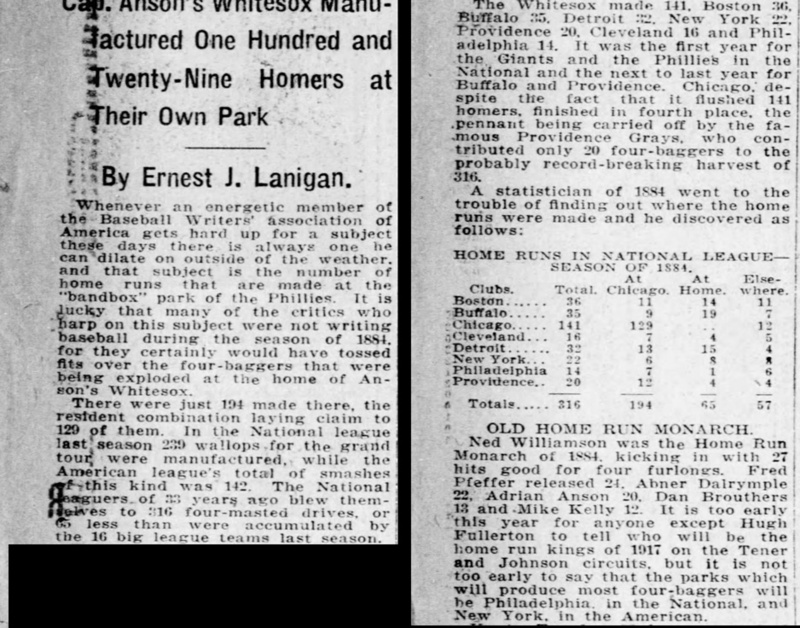 The Detroit Free Press would occasionally write a headline like "Chicago wins with homers because of the fence," but did not elaborate within the article. 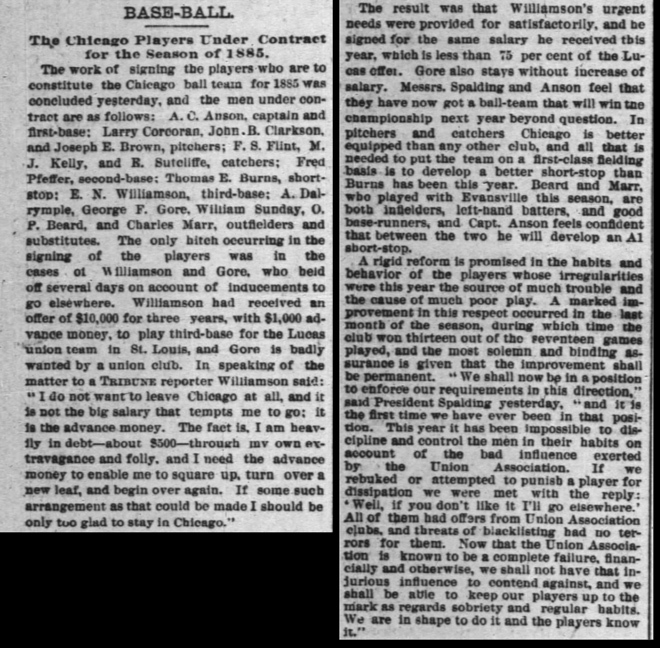 You see, the reason nobody noted or respected Williamson's achievement at the time is that everyone who followed baseball in his era was well aware of the tainted nature of any performances achieved in Chicago's home park that year. The Chicago White Stockings had played the 1884 season in a park with foul lines so short that the homers hit there would have been considered a soft touch in little league. The left field line was only 180 feet from home plate, made to play even shorter by facing mainly westward, allowing even easy pop flies to be carried into Michigan Avenue by the stiff breezes blowing off the lake. The right field was not much longer at 196 feet, but in that direction at least a batter needed to drive the ball northeasterly into the lake winds and over a 37 1/2 foot fence which had been erected to keep fans from watching ball games for free from a nearby viaduct. 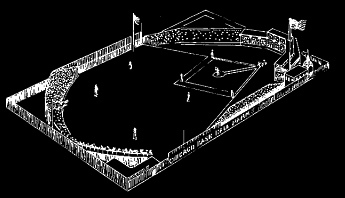 The name of the stadium was Lake Front Park, and it caused statistical distortions that have never been matched by any subsequent field in major league history, not by Coors or Mile High with their altitude-enhanced flights, nor the Polo Grounds and Baker Bowl with their invitingly nearby right field fences, nor Wrigley Field with the wind blowing out so often and so fiercely. There were 321 homers in the National League that year, up from a mere 124 the year before. 194 of those homers were hit in Lake Front Park, which therefore accounted for just about all of the year-to-year increase. There were 3.5 homers per game at that park. In all other games that year, there were .31 homers per game. In other words, homers were hit in Lake Front Park about 11 times more frequently than under the league's average remaining conditions. The 11:1 ratio also held almost perfectly for the White Stockings as a team. They hit 129 at Lake Front Park and 12 on the road, according to a 1917 article by famed sportswriter Ernest Lanigan in the Pittsburg Press. (Yes, that's how they spelled Pittsburgh. See the entire page below, which you can click to enlarge.) As far as we know today, he and his researchers had gotten the 1884 details more or less correct. (He attributed 141 homers to the White Stockings, while the modern sources say 142; he attributed 316 to the league, while the modern sources say 321; and there is a discrepancy of one homer apiece on several of Williamson's teammates. In fairness to their sluggers, it should be noted that the 1883 rule probably deflated their home run totals that year, just as the 1884 rule inflated them, since balls over the fence were doubles in 1883, no matter how far over the fence, so home runs were difficult to come by. 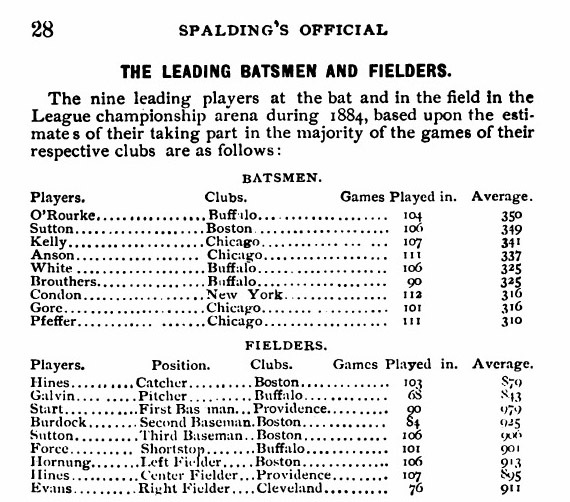 The contrast between their home run totals in 1883 and 1885, as shown above, seems to support that theory. As expected, that encyclopedia again listed Buck Freeman as the record holder for a major league season. Williamson was finally listed as the record holder in the 1916 update of the Spalding Official Baseball Record, 32 years after the fact, and 22 years after his death. Even that source claimed that the achievement had allegedly taken place in 1883, not 1884. 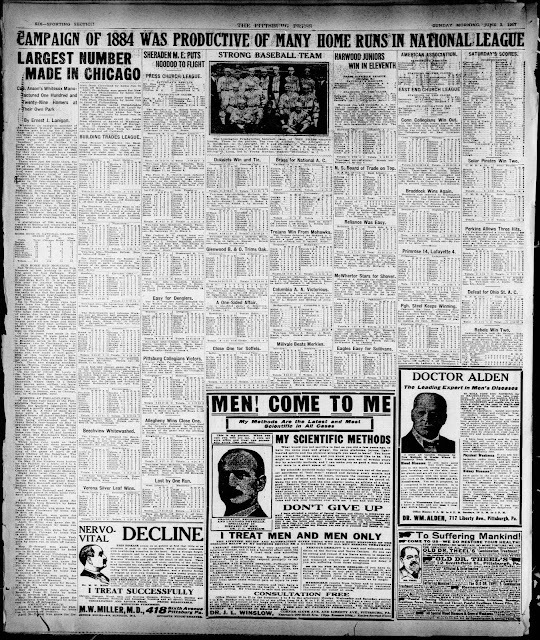 The record was not properly nailed down until Ernest Lanigan and his researchers assembled all the details in 1917, as shown in the Pittsburgh paper pictured earlier. If Ned Williamson could come back to life today, he would probably be as surprised as anyone to find that he had ever been considered the record-holder for home runs in a single season. In fact he would probably be more surprised than anyone else, since he would know full well he was only the seventh best home run hitter on his own team! By the way, the center card above notwithstanding, Ned played only seven games at second base in his entire career, which spanned thirteen seasons and 1225 games. He played about 700 games at third base and more than 400 at short. Enough about Ned for a while. 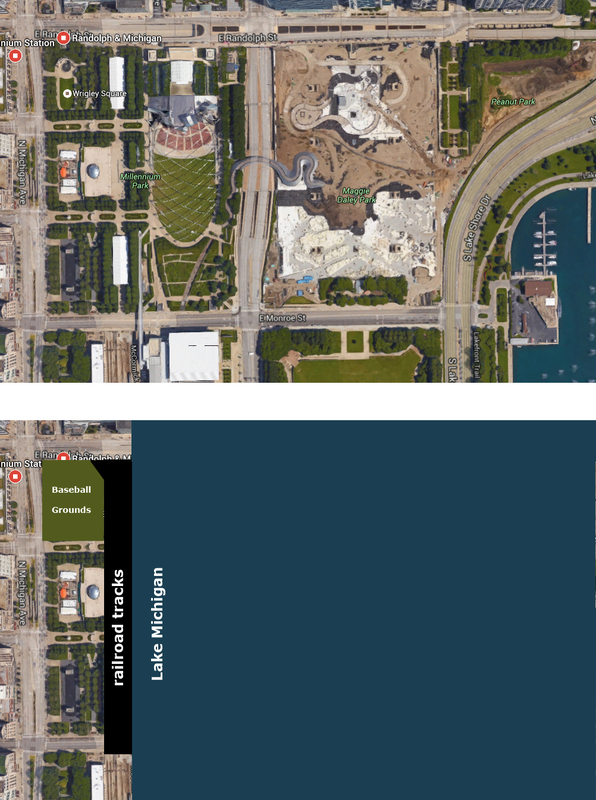 Let's consider how Lake Front Park got that way. It's a long story, but I like long stories, so here we go. If you have really been paying attention to this article and are at all familiar with the geography of Chicago, you may have wondered when reading the preceding paragraphs, "Why did they call it Lake Front Park if a homer went out on Michigan Avenue? That's gotta be, like, a mile from the lake." Yes, you are right. It's because Michigan is a very tricky lake. Sort of. Ever since the Civil War era the city of Chicago has been reclaiming more and more land to expand the shore. 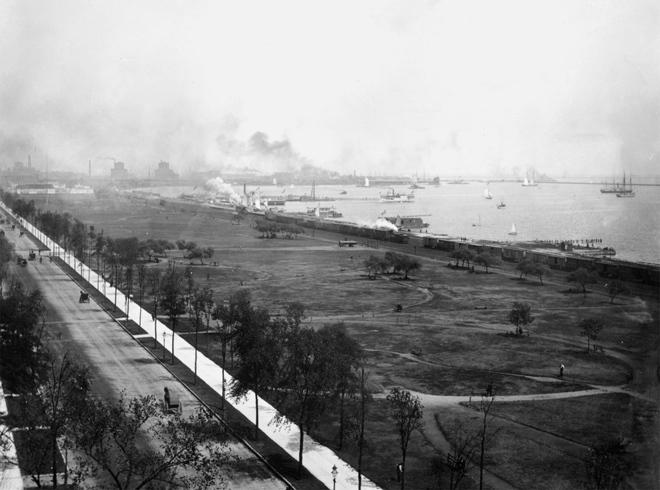 If you could time-travel back to the early 1850s, you would see that Michigan Avenue was so-called because it was on Lake Michigan. 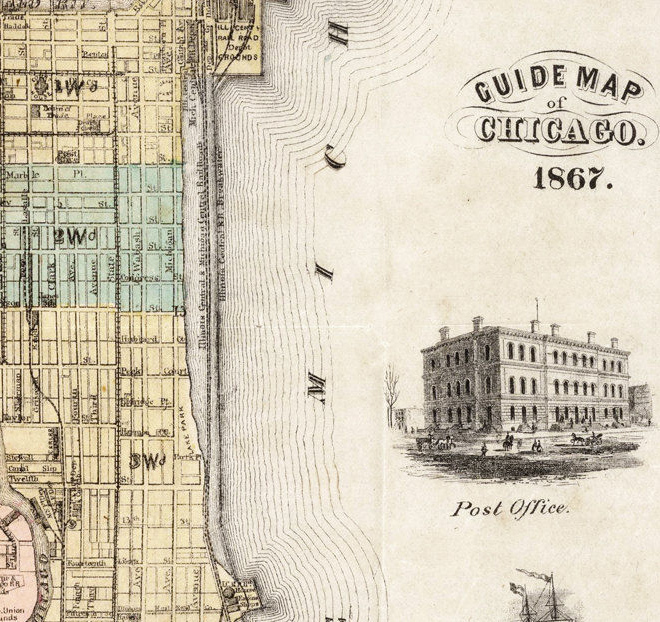 In the period after 1856, Michigan Avenue was still on the shore, but now abutted what I am going to call a lagoon, following the example of the newspapers of that day. That area had been separated from the main body of the lake by a breakwater created in the 1850s for the Illinois Central Railroad. The illustration below, made in the Civil War era, shows the railroad trestle, the breakwater, and the Michigan Avenue shore, with pleasure boats still sailing on the lagoon. And here's how that area was portrayed on an 1867 map. At that point the site of Lake Front Park was not on the lake, but in it, if I can fairly call that area part of the lake. It is the very northernmost section of the lagoon, running just east of Michigan Avenue from Washington Street on the south to Randolph Street on the north. You can already see from the map that it could not be turned into a very large tract of land, because it was boxed in by Michigan Avenue and the train tracks. The photograph below, taken in 1858 when the area was still mostly underwater, illustrates just how cramped the space would be. Here is the same view, looking northward toward the old railroad depot (the distinctive building with the three arches) just a bit later, when the lagoon was in the early stages of reclamation. The area where the baseball field would be located was the very first part of the lagoon to be reclaimed. 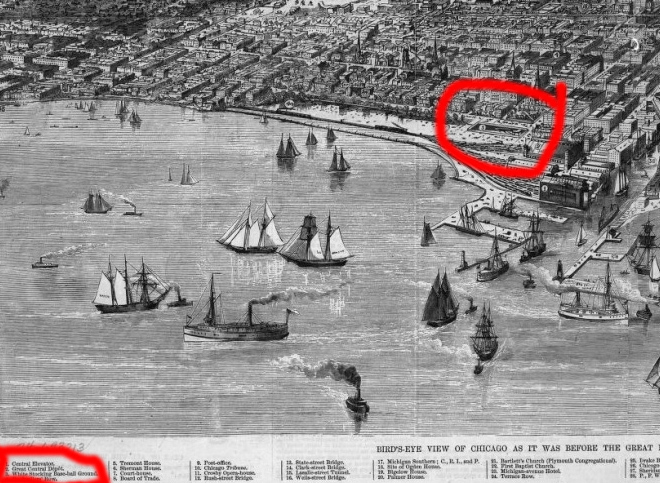 The 1871 map of Chicago below shows what the city looked like just before the great fire, portraying the first White Stocking ballpark built on the site, back when the team was in the old National Association. 1871 was the first year of organized professional "major" leagues in the United States, but the National League was still five years in the future. 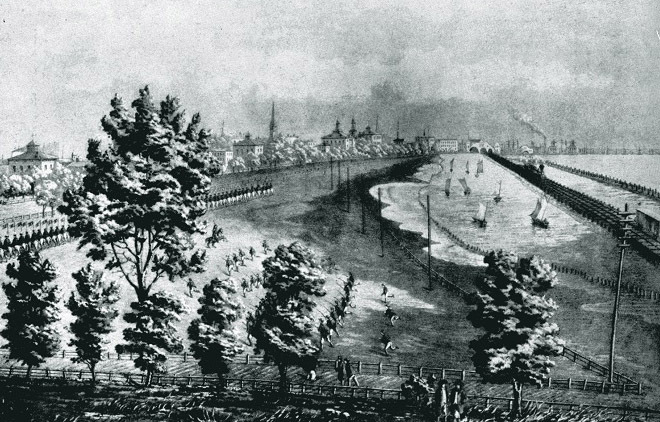 The ball field indicated in the drawing above is not the notorious Lake Front Park of the 180-foot fences, but a rickety old wooden stadium called the Union Grounds, which was somehow cobbled into the space in such a way that all the fences were a uniform 375 feet from home. This seems to have been possible because the Union Grounds extended south of Washington Street, while the later, smaller field at Lake Front Park did not. The location was, however, that very same southeast corner of Randolph and Michigan later occupied by Lake Front Park. 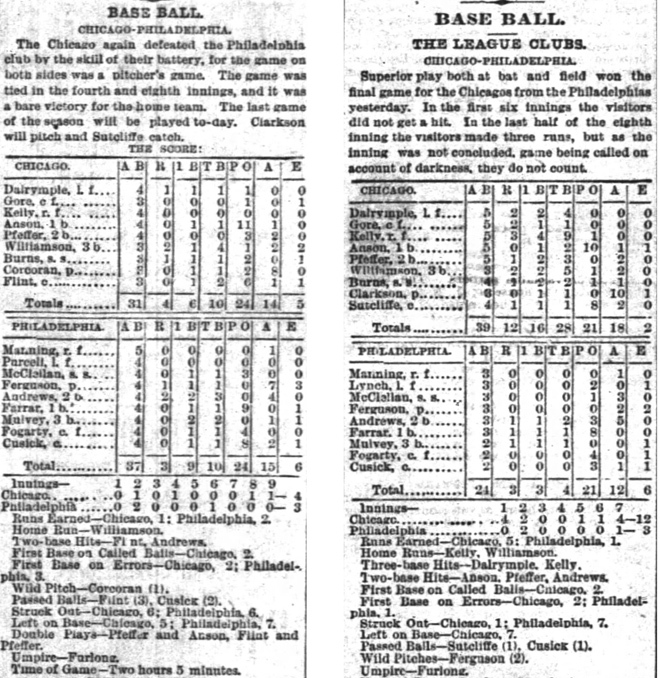 Unfortunately for the city, the first year of professional baseball was also the year of the Chicago Fire, and the stadium, along with much around it, was destroyed, so the team did not play the following two seasons, and when it finally did return, played elsewhere in the city from 1874 until 1877. Baseball did not return to the lakefront for seven years. The catastrophic Chicago Fire did bring some ancillary benefits to the city. It provided an incentive to build and modernize the destroyed neighborhoods, of course, and it also provided debris that was helpful in filling in the rest of the lagoon. 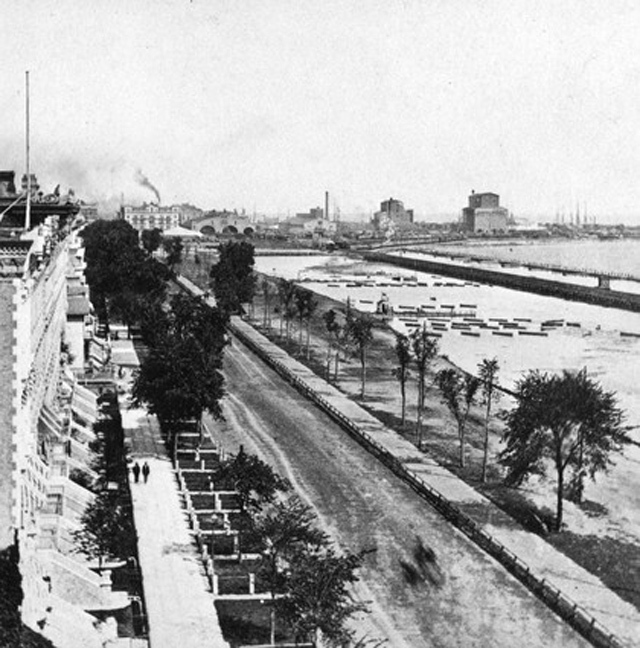 By 1880, through a massive project of co-operation between the city and the railroads, the lagoon was completely gone, as seen below, with part of the new land eventually going for additional train tracks on solid ground, replacing the old trestle, and the rest of the area dedicated toward creating green space and architectural marvels like the Interstate Industrial Exposition Building, where the famous 1880 Republican Convention thwarted General Grant's bid for a third term. Today the area is generally known as Grant Park, rather ironically since it marks the only place where Grant ever failed at anything important. The picture below was again taken from the south facing north along Michigan Avenue, a very similar perspective to the one above, but this time around 1880, by which time the White Stockings had already moved back to the former site of the old Union Grounds, which would be at the very far northern end of the new landfill park pictured here, although the baseball field it is not really visible (or at least not recognizable). By this time, the games were being played at the infamous Lake Front Park, which in 1878-1882 was not as fancy as the 1883-1884 version, but comprised essentially the same playing area, with similar dimensions and the familiar pre-1884 ground rule stipulating that a ball over the fence was a double. 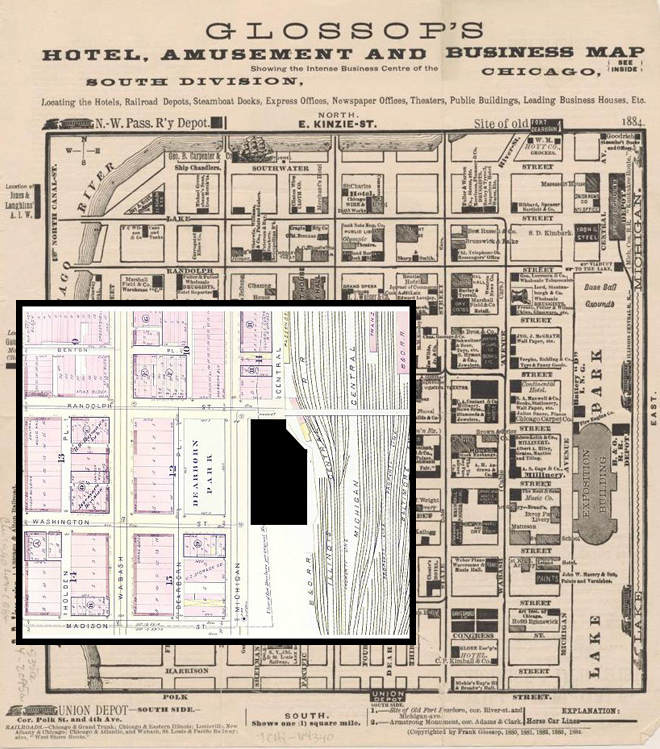 A promotional business map of Chicago (below) gives the exact 1884 location of home run heaven (called "Base Ball Grounds"), and the inserted plot map gives a more accurate definition of the space actually available for the ball grounds (the blacked-out area). To my knowledge there is no known photograph of Lake Front Park, either in its 1878-1882 avatar, or in the upgraded version, which was then considered the state of the art in baseball facilities. (It even had luxurious sky boxes where the city's plutocrats could avoid mingling with the hoi polloi.) The drawing below is rich in detail, however, and the exterior fence, whitewashed to match the wide white promenade beside Michigan Avenue, is pictured exactly as it is described in the articles of the day. 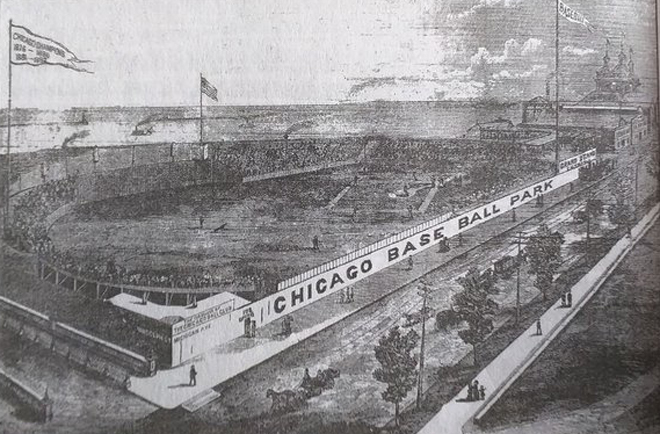 This rendering must picture the upgraded 1883-84 version of the park, because the pennant on the top left takes note of the 1881 and 1882 World Championships. Barely visible beyond the stadium to the south is the famous Interstate Industrial Exposition Hall. The pitcher seems to be tossing the ball almost due south in this representation. But in the rendering to the right, the pitcher seems to be facing a more southwesterly direction. At this time I can't say which, if either, is correct, and I don't know whether the drawing to the right is from their era or ours. We do know that the famous white fence ran exactly parallel to Michigan Avenue, which is laid out due north and south. I want to talk a bit about that White Stocking team, but before I do, let me briefly finish the tale of the lakefront, even though the portion of the story germane to baseball has been completed. The city continued to reclaim more and more of the Lake Michigan shore through the 1920s, and even a bit later. 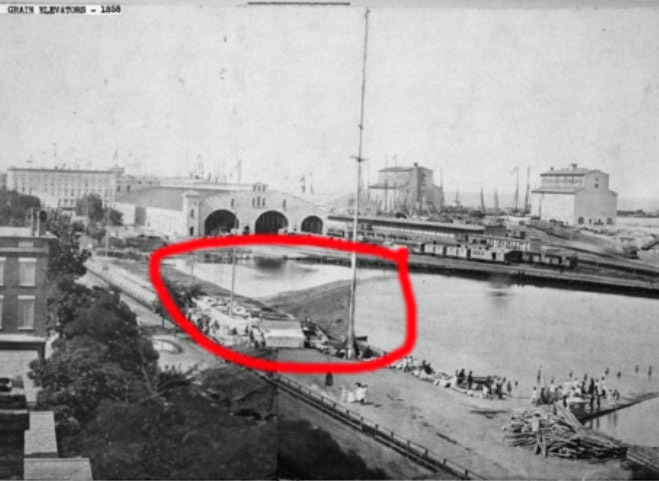 In the two images below, you can see today's coastline, and a representation of where it was in 1884, when the 180-foot homers flew out into Michigan Avenue. (Click to enlarge.) And remember that just 20 years earlier, even that green strip, beginning at the baseball grounds and going due south, consisted of water, with the railroad trestles and a breakwater between that lagoon and the lake proper. The White Stockings were a great team, the very first dynasty of the National League. Yes, I know their name makes it sound like they should be predecessors of today's White Sox, but in fact they are the Chicago Cubs, an unbroken line and an unrelocated franchise from the very birth of the National League to the present day. Today they are in a championship drought that has lasted more than a century, but in those days they expected to win all the time. From 1880 until 1886, a seven-season stretch, they were the world champs in five of those seven years, and they did it with almost the same team from start to finish. Here are their main players from the first and last years of their dynasty. As you can see, the only meaningful change is that Joe Quest, whose grandson Jonny would go on to become a cartoon character, was replaced in 1883 by Fred Pfeffer, who would go on to a solid career in the majors that lasted sixteen years, and who was almost the retroactive home run king himself, having hit 25 homers the year Williamson hit his 27. 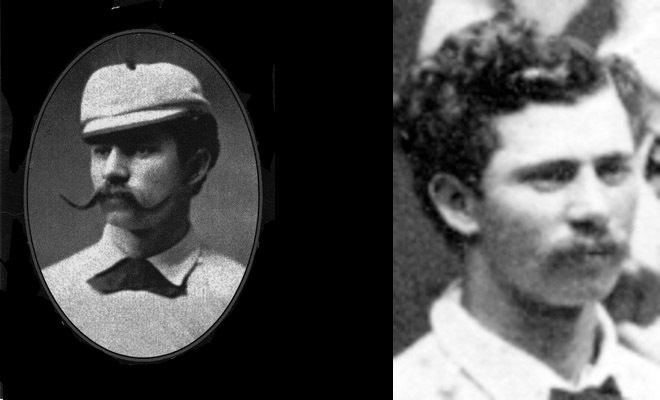 Ned Williamson and Tom Burns traded positions toward the end of the run, which doesn't surprise me because I read a bunch of 1884 newspapers, and they were filled with sentiments like "Our gallant lads are sure to emerge triumphant in the next season's gladitorials, for our only weakness this year was the inconsistent shortstopping of Burns." That's not really a quote, but they did write like that. 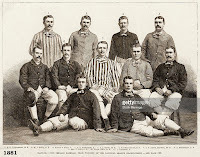 Click on this thumbnail of a team portrait to see a nice artist's rendering of the World Championship 1881 team, when Quest had not yet been replaced. As good as they were for so many years with the same personnel, there were two years when they did not win the NL pennant. I'll bet you can guess which two years they were. Yup, it was the two years at their refurbished Lake Front Park. The first year there, 1883, they dropped to second place after three straight pennants. The next year, 1884, was the year when they changed the ground rule to allow a cheap homer, and they sank all the way to fifth (actually, I think it was a tie for fourth). As soon as they left that park, they zoomed right back into first place for two more years, during which they improved from .550 ball to approximately .750 ball without changing personnel. Another, perhaps more cogent, explanation for the White Stockings' failure to win the pennant that year is that nobody was going to challenge the Providence Grays in 1884. They were the team of destiny. Old Hoss Radbourn turned in his epic 59-win season and his mound mate in the season's early going, Charlie Sweeney, was matching the Old Hoss win-for-win, even including an unheard-of 19 strikeouts in one game. Radbourn finished the season with a 1.38 ERA, Sweeney with a 1.55. The Grays allowed only 185 earned runs all year, and played better than .800 ball at home. They won the pennant by more than 10 games in a 112-game season. I just don't see where a slicker shortstop was going to be enough for the White Stockings to overcome the kind of pitching exhibition put on by Old Hoss and company. And, let's face it, the 180-foot homers were just a bad idea. How far can a major leaguer hit a baseball? The discussion has to begin with a definition of terms. We don't mean "off the top of Mt Everest" or "on the Moon" or even "in Denver." If you were to go take Giancarlo Stanton out to an open field in Denver and let him hit with an aluminum bat on an 70-degree day with a 40 mph tailwind, he could probably blast some monumental homers. But that's not what we mean. We are trying to determine how far a very powerful man can drive an official baseball with a legal wooden bat, assuming that the ball lands at field level, there is no wind, the park is at sea level, the temperature is 75 degrees, the barometer is steady at 29.92, and the relative humidity is 50%. Given those parameters, we can use physics to make the determination. All we need is the exit velocity of the ball from the bat, and then we can determine the optimal flight angle necessary to maximize the carry, using a downloadable Excel spreadsheet created by a physicist. We can obtain that exit velocity. Home Run Tracker charted every major league home run for more than a decade, and the highest exit velocity they have ever recorded or estimated for a ball leaving a wooden bat is 122.4 mph. Note that there were nearly 1.5 million batted balls in MLB in that period, and only 18 homers were produced by a ball velocity of at least 120 mph off the bat. It is such a rarity that in 2014 and 2011, there were none at all. But we'll assume 122.4 mph as the human limit for our model, since it has been done once, when Giancarlo Stanton hit a grand slam off Jamie Moyer in that ageless pitcher's second-last game in May of 2012. Making all the standard assumptions I listed above, a ball with an exit velocity of 122.4 mph, stroked at the optimal angle for carry, will land a bit less than 515 feet away. 515 feet is the very limit for human beings as we know them today. Mind you, that distance is highly unlikely to be achieved in reality, since only one batted ball out of a million is hit with that velocity, and on that one time in a decade when it happens, there is no guarantee that it will be launched at the optimal angle with the optimal spin (severe topspin would decrease its flight distance, as in any ball sport). Let's look at a more realistic possibility. How often can we expect to see a ball hit 500 feet? If we drop the exit velocity on the model to 120 mph, we see that a 500 foot homer can be produced within a certain range of lift angles. A quick look at Giancarlo Stanton's home run history shows that he hits about a third of his homers within that range. Let's assume that he is typical in that regard, and that about half of the homers launched at the right angle also spin appropriately. Based on those assumptions, the 18 balls which reached that velocity in the past decade should have produced six homers capable of exceeding 500 feet, of which perhaps three would have the correct spin to actually reach that distance. 502 feet would be the maximum distance achievable from a launch velocity of 120 mph. According to Home Run Tracker, there were five homers in the range of 494-504 feet during their existence, which is quite close to our expectation, and is probably virtually identical, because we have made some assumptions, and Home Run Tracker has made some estimates. They estimate where a ball would have landed at field level by using the known parameters and sometimes those observable parameters are not always detailed enough to get the distance precisely right. At any rate, only one homer in the past ten years traveled, or rather would have traveled if allowed to land at field level, 500 feet or more. In late September of 2008, Adam Dunn blasted a 504-footer off Glendon Rusch at Chase Field. That one is a completely legitimate 500-footer, in that it received only a minimal amount of assistance from meteorological conditions. HRT estimated that it would have traveled 502 feet in our defined standardized conditions, and that is an exact match for our guess for the theoretical realistic maximum. It's important to realize, however, that today's players are bigger and stronger than their predecessors, yet those brobdingnagians produced only one 500-foot homer in more than ten years. The conclusion to be drawn is this: any time you read of a homer traveling more than 515 feet, it can only be attributable to Mother Nature or Mother Goose. Even 500-foot homers are exceedingly rare. Giancarlo Stanton, for example, at 6'6" and 240 pounds of solid muscle, and almost certainly the strongest hitter in baseball today, if not in all of history, has never hit a ball 500 feet, with or without the wind, as of the end of the 2015 season. At that point he had hit 181 official major league home runs, and the longest one recorded by HRT was a 494-footer he hit in August of 2012 - and that was in Coors, aided by the altitude! (The video is below.) In the 2016 Home Run Derby, he hit 61 blasts, including the eight longest of the competition, but still failed to reach 500 feet with his longest (497). What about the legendary homers in history? Mythology or meteorology. As Sherlock Holmes might advise, rule out the impossible and find the solution among the other options. 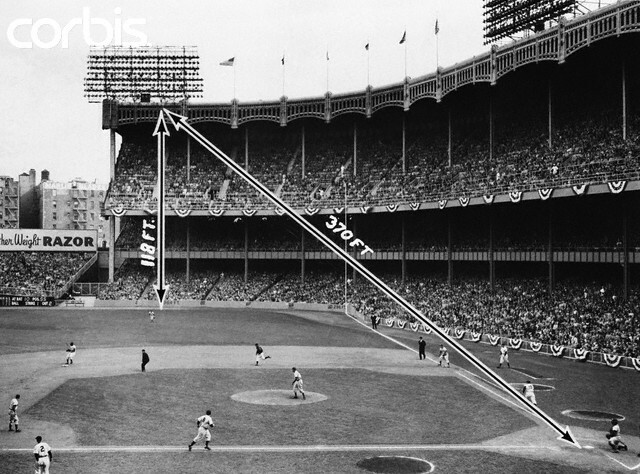 Based on the same theoretical model, the only legitimate 500-foot homer in history I could find that was not affected by the weather conditions was Mickey Mantle's blast off the facade in Yankee Stadium in 1963. Mickey said this was the hardest he ever hit a ball, so let's assume he produced a ball velocity of 120 mph off the bat. 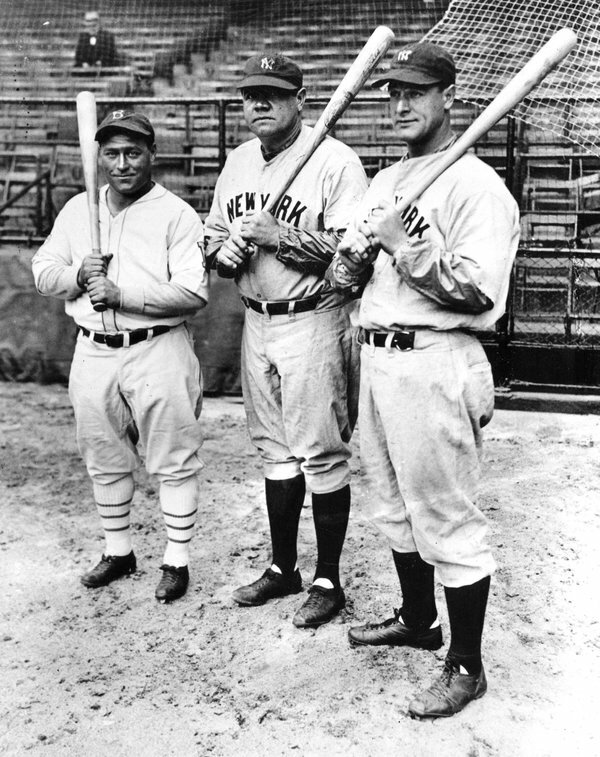 He would not be able to go to go much beyond that, because Mickey, at 5' 11 1/2", 195 lbs, was much smaller than Stanton or Dunn, and his shorter arms would be at a major disadvantage in creating the kind of torque produced by those giants. (Adam Dunn played at 6'6", 285.) Furthermore, the pitchers of Mickey's day were not consistently throwing with the velocity of today's pitchers, so Mickey wasn't getting as much help from them. (Disregarding the spin, the general rule is: the faster the pitch, the faster it comes back off the bat). We know precisely where Mickey's homer struck the facade, and it was at a spot 363 feet from home plate and 102 feet in the air. If we assume a lift angle of 25.5 degrees at 120 mph, we can get the ball to that exact point, and we therefore can determine that the ball would have traveled 502 feet in the air if allowed to land at ground level. The temperature was 70 degrees and there was a 13 mph breeze blowing that day, but it was blowing out to left field and Mantle hit his ball to straightaway right, so the wind was no factor and it was a certifiable 500-footer. Note: the original image above shows that the facade was 370 feet away and 118 feet in the air. If that is correct, then the ball would have required a lift angle of 30 degrees to get there, and would therefore have come down sooner, at 496 feet. That is a possible alternate assumption, but we believe the revised distances (363, 102) to be correct. One analyst asserted that Cecil Fielder hit a 502-foot homer in 1991. The distance on that one is certifiable, so Fielder may join Mantle and Dunn in the 500 Club, but the wind information is missing, so we cannot be sure. One other ball that we have good data on came close to 500. Roberto Clemente timed a hanging breaking ball from the great Sandy Koufax in 1964 and blasted a low liner into a light tower at Forbes Field. It was already 457 feet from home plate when it hit the tower, and that spot was 32 feet above the ground. 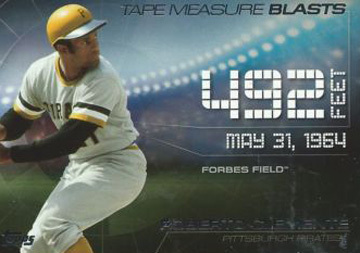 If the ball left the bat at 119 miles an hour, just slightly sub-Mantle, with a low lift angle of 21 degrees, typical for Clemente, it would get to that exact point, and we can therefore extrapolate that the ball would have traveled 492 feet if unobstructed, as shown in the baseball card above. There was no appreciable wind that day. Surprisingly, neither Clemente nor the Pittsburgh sportswriters seemed suitably impressed at the time. 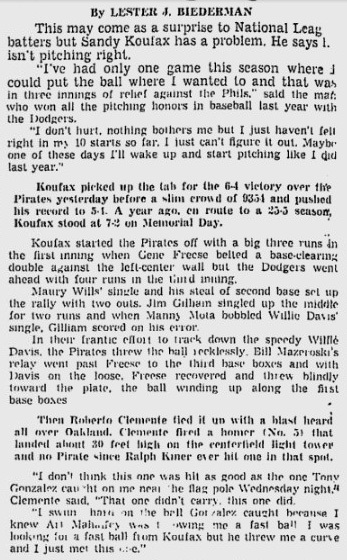 The article in the next day's Pittsburgh Press (click on the thumbnail to the right to see it at full size) said that Clemente felt he hit one better in an earlier game - and that one was caught for an out. 1. A young Mickey Mantle hit a legendary blast off Chuck Stobbs at Griffith Stadium in Stobbs's first start of 1953. Baseball lore has recorded this as having traveled either 562 or 565 feet. It didn't go that far, but it went a long way, and it still seems to be the longest one we can validate. We know two things about its path: (1) it nicked a sign 460 feet from home plate and about 55-60 feet in the air; (2) it had to strike or clear a 22-foot roof about 512 feet from home plate in order to get into the backyard area of another set of row houses; (3) it did not clear because the ball was ruptured from where it struck the roof. We also know what the weather report was that day. Mantle himself has said that the tailwind was "about 50 mph," but Sam Diaz, a local meteorologist, reported more precisely that the wind was 20 mph, gusting to 41. If we assume the ball left the bat at 115 mph (remember Mantle said he didn't hit it as hard as the other one), took off at a 29 degree angle, and had an average wind velocity of 20 mph (a ball is typically not affected by the wind for about the first 15% of its flight), the model produces the exact values we need for all points on the parabola, and tells us that the ball would have carried about 542 feet unobstructed. A researcher and a physicist studied this homer in depth and came to the same conclusion, albeit with slightly different assumptions. 4. Dave Kingman blasted a mammoth drive out of Wrigley Field in a 1976 game, assisted by a 16 mph tailwind. We don't need much theory to determine where that would have landed, because we know exactly where it did land - on the porch of the third house from the corner on Kenmore, 530 feet from home plate. To my knowledge, Kingman's homer landed the farthest from home plate of any blast in history, because the ones we consider longer are based on theoretical landing places, while Kingman's actually came to earth. 5. On May 11, 2000, a Cubbie named Glenallen Hill hit a moon shot out of Wrigley Field and onto the roof of a building across the street from the stadium - about 30 feet above the field and 460 feet from home plate. There was an 18 mph wind behind him, so placing 85% of that into the model and assuming 111 mph exit velocity and a lift angle of 28 degrees will get the ball to that exact spot and produce the final unobstructed distance of 500 feet. This homer is partially tainted since Glenallen later admitted to having used PEDs, but he has earned his way back into the game's good graces through tireless efforts as a long time coach and minor league manager. Note that none of these five homers were hit with enough force to travel 500 feet without the wind. Each of them would have been in the 450-485 range, which is still a rare achievement. With these five eliminated, Mantle and Dunn are the only two guys who can be said to have driven a ball 500 feet on their own power, and even those two come with some caveats. Dunn's 504 was powered by steroids, and Mantle's 502 may actually have been 496 if those originally published stadium dimensions were correct. I have not covered every tape measure shot in baseball history, but you can be quite confident that any hit from a wooden bat carrying beyond 515 feet must be created by extenuating circumstances because the laws of physics determine that they cannot be entirely self-propelled. Slightly shorter historical homers, those purportedly in the 503-515 range, could have been entirely self-propelled, but almost certainly were not. 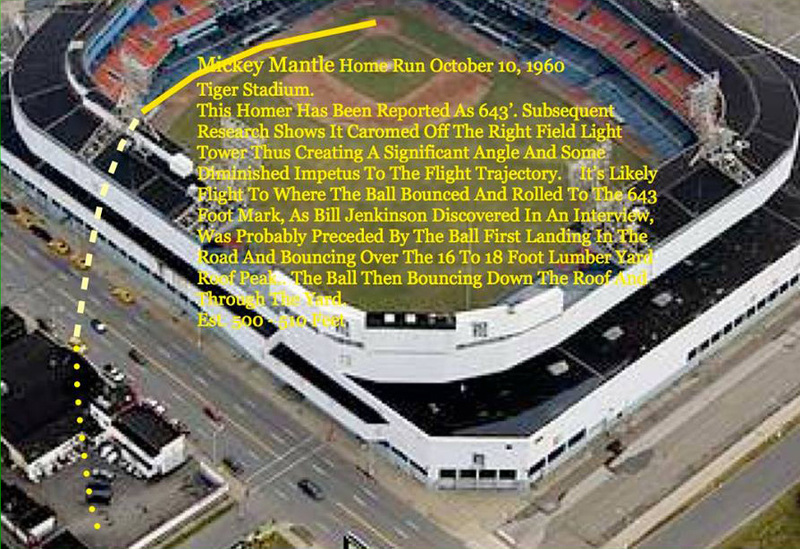 What about Mantle's 634 or 643 foot homer off Paul Foytack that went out of Briggs Stadium in 1960? (It was renamed Tiger Stadium the following year.) That landed in the lumber yard across the street. It is possible to hit a ball 634 feet if it is lifted at 30 degrees with a speed off the bat of 120 mph in a 40 mph wind. Given that nobody has reported such a wind that day, it would be wise to maintain a healthy skepticism. It was very possible for a 500-foot homer from that park to cross Trumbull Avenue and hit the roof of Brooks Lumber on a nearly windless day. These are not places shrouded in myth. 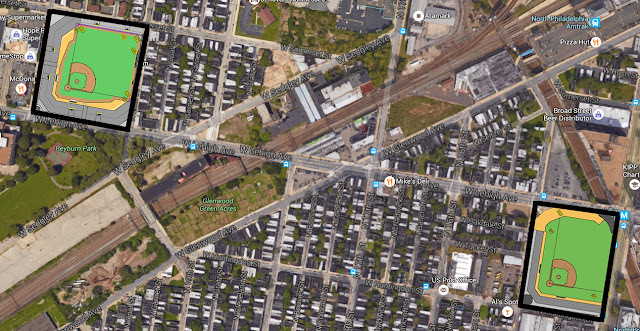 Brooks Lumber is still where it always has been, as is the home plate of old Briggs/Tiger Stadium, and we can get a scaled map from Google Maps. 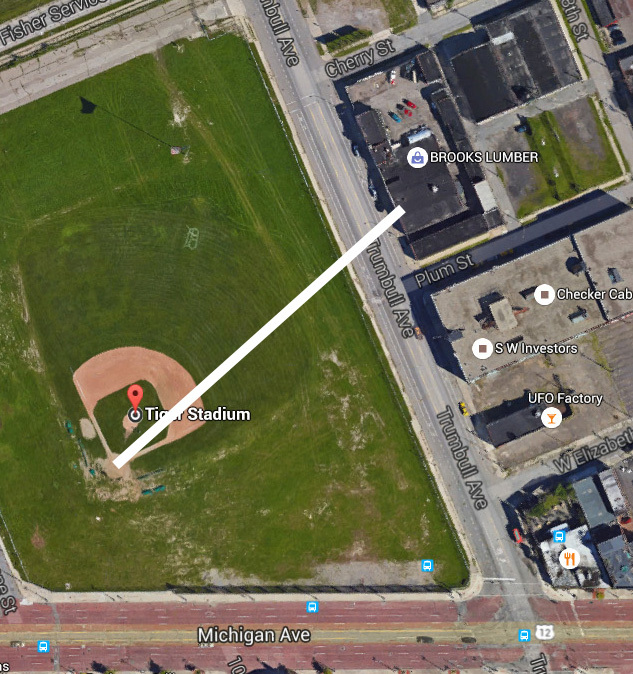 Shown below is a very plausible 500-foot path from home plate. The men who saw it "land" do not know whether it landed there on the fly or the bounce. How could they? Here is a physically possible scenario: Mantle launches the ball at 116 mph, less than his facade shot, at a 31 degree angle. With just a gentle 10 mph breeze behind him, he easily clears the back of the 94-foot grandstand at a point some 385 feet away at that angle, and gets the ball to the lumber yard roof, about 499 feet from home plate and about 18 feet in the air. He then gets an enormous bounce off the hard surface of that roof, and the story is born. My guess is that it landed at point X in the picture below and caromed left-rear into the company's open courtyard area, where the employee may well have seen the ball land some 600 feet or more from its launching pad - on the first or second hard bounce. That happened on September 10, 1960. It's worth noting that Mantle's homer that day, unlike the monster blast he unleashed at Griffith Stadium, gathered no special attention from observers. 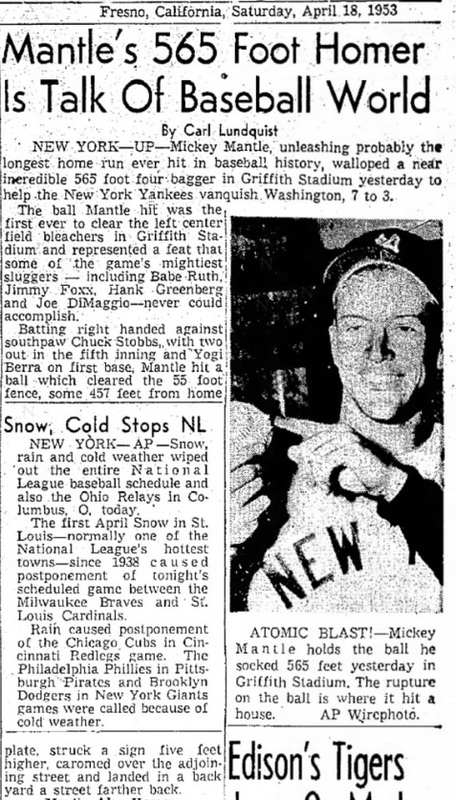 The Associated Press report which appeared across the country the following day (click on the thumbnail to the right) was casual about the achievement, simply noting that it was the third time Mantle had cleared the roof, and the only other player to do so was Ted Williams. At the time, nobody felt it might be the longest homer in history. It later grew from a homer to a legend. Afterthought: some weeks after I wrote this article, I ran into the annotated picture below. The author (whom I have failed to identify) drew almost the exact same conclusions as I did about the Briggs blast, although he feels the homer's first bounce was probably on the road rather than on the roof of the lumber yard. That is actually more likely than my hypothesis, since it would require about 490 feet of carry rather than the 510 or so necessary to go a few more feet forward and hit the roof that high. I like his similar theory better, but when I created mine, I thought the road had been ruled out as a possibility. Like Mantle's blast in Detroit, Josh Gibson's legendary blast out of Yankee Stadium started as a homer and grew into myth. 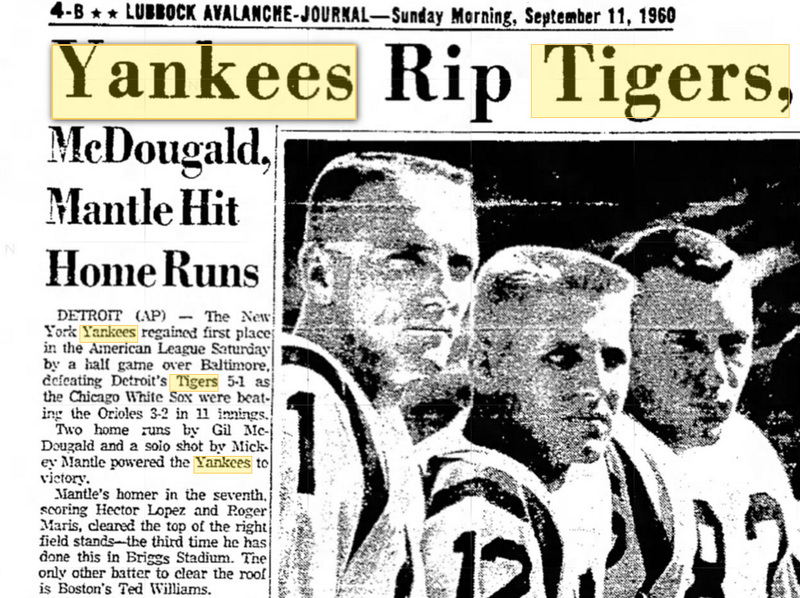 In this case we don't need any physics to debunk it because it never left Yankee Stadium. It landed in the bullpen. Here are two articles (1, 2) which explore this matter in depth, using contemporary accounts and interviews with other players who were there that day. What about other 600-foot blasts from Gibson, Mantle and others? Once again, it is possible to hit a ball 600 feet with a massive tailwind, so don't assume every account is false, but remember that Mantle's blast out of Griffith Stadium, even if you believe the hype, did not go 600 feet, and that was Mickey Effin' Mantle with a tailwind which may have been as strong as 41 mph, so approach such accounts with caution and skepticism. And if you read about such a thing happening on a calm day or in an indoor stadium, well ... it never happened. Simple as that. Which power hitters were more (or less) powerful than you think? The last couple of decades have brought about a revolution in baseball statistics. Analysts like Bill James have given us new ways to view the raw data, while tireless researchers keep giving us ever more raw data to view. One thing that we have now that we did not have before is detailed home/road and park data. While not every stat has been broken down into home and away segments for baseball games from the deadball era and the 19th century, we have solid numbers for every season since 1920, and we have home run data dating back even before that time. This information sheds new light on some of our previous assumptions. 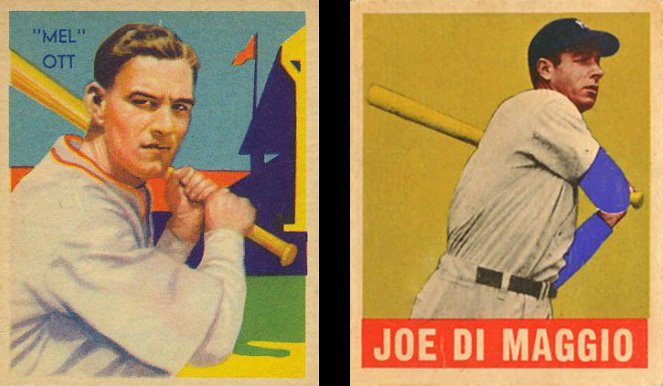 When I was a boy, we saw these lifetime home run totals: Mel Ott 511 (then the all-time NL leader), Joe DiMaggio 361. We could see that Ott had far more at-bats, but there was a gap of 150 homers between them. The numbers seemed so decisive, right? Ott was a left-handed hitter who played his entire career in the Polo Grounds, where the right field foul pole was about 250 feet away. DiMaggio played his entire career just across the river in Yankee Stadium. Yes, they were that close. See below. Here is how they were oriented, relative to the modern street grid, with North on top. 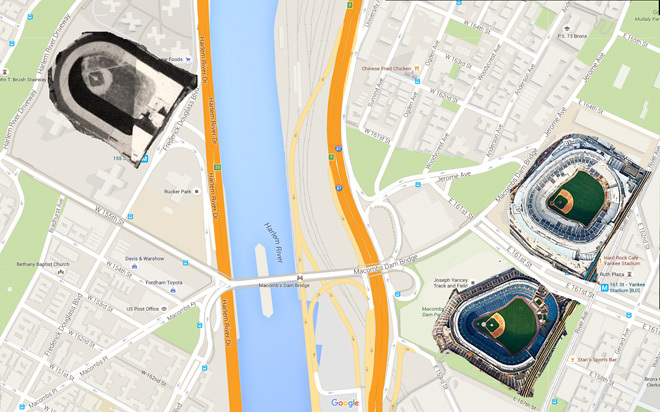 The original Yankee Stadium, DiMaggio's haunt, is the one on the lower right. Just above it is the newer one. The Bronx park was much friendlier to lefties than to the right-handed DiMaggio. That produced some freakish home/road splits in their home run stats. Relative to each other's stats, their home parks made a difference of about 200 homers. If they had played their careers in neutral parks, assuming 2X their road numbers, DiMaggio would have finished with 50 more homers than Ott rather than 150 fewer! On a "per at-bat" basis, the difference is far more dramatic. DiMaggio hit a homer every 16 at bats on the road, while Ott connected every 26 trips. Over a hypothetical season of 550 at-bats, that would result in 34 homers for DiMaggio, 21 for Ott. DiMaggio was not only a better home run hitter than Ott, he was far better, beyond any shadow of doubt. If Mel Ott had neutral home/road stats, he would have finished with some 370 homers, about the same as Tony Perez or Gil Hodges. That means he was a good power hitter, but certainly not as good as we thought he was fifty years ago. And it could have gone much worse for him than "neutral." In his career splits, we see that he had 268 at-bats at Shibe Park and never hit a single homer, while batting .220. In Cincinnati he hit only thirteen homers in 699 at-bats. This section makes it seem that I am disparaging Mel Ott, and that would be misleading. It's important to realize that while the Polo Grounds inflated his home run totals, Ott was an excellent hitter whose lifetime batting average was actually better on the road! In fact, he had more extra base hits on the road! His lifetime splits clearly indicate that the Polo Grounds basically just converted his doubles and triples to homers. Who else benefited greatly from home parks? To begin with, the lifetime totals are wildly and positively skewed for any lefty hitter who played in that rickety old wooden stadium known as the Baker Bowl or anyone who played in Coors Field. Chuck Klein rode the Baker Bowl to the Hall of Fame. His lifetime batting average there was a phenomenal .395 with a .705 slugging average. Throughout Klein's career, he hit 192 homers at home, only 108 on the road. The following representation of the Baker Bowl will show you why. The Baker Bowl also affected Klein's fielding stats. He not only hit the ball toward the short right field fence, but he was also a right fielder. Once he learned how to play the wall and the tiny area available to him, he was able to use his strong arm to throw out a record number of runners who just didn't realize how fast he could retrieve the ball and how close he was to the infield. One year he amassed 44 outfield assists, a modern record which will probably never be approached, given that the highest total since World War II has been Roberto Clemente's 27 in 1961. 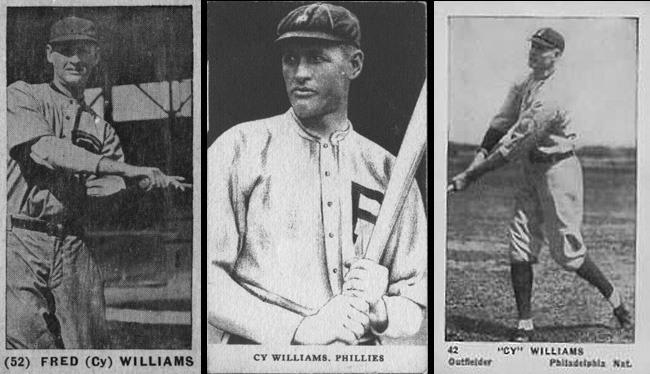 Cy Williams, another lefty who played most of his career in the Baker Bowl, didn't make it into the Hall of Fame, but he won four home run crowns and the friendly Bowl was a major contributor to three of them. In 1920 he led the National League with 15 homers, 12 of them in the Bowl. By 1923, the National League had started to produce similar power numbers to the AL, and Williams blasted 26 homers at home. Throughout his career, he hit 167 dingers at home, just 84 on the road. Among all major leaguers with 250 or more homers, he has the highest percentage of his total at home (66%); Chuck Klein has the second-highest (64%). Both were lefties who played their home games primarily at the Baker Bowl. It's time for one of my famous barely-related digressions. 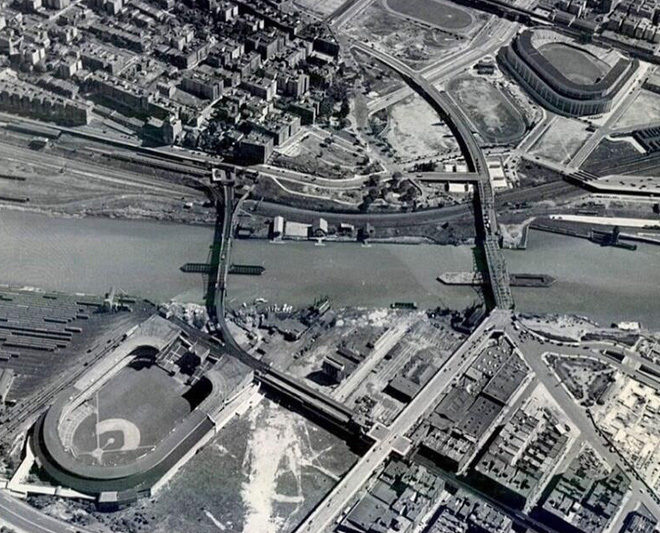 You saw above how close Yankee Stadium was to the Polo Grounds. 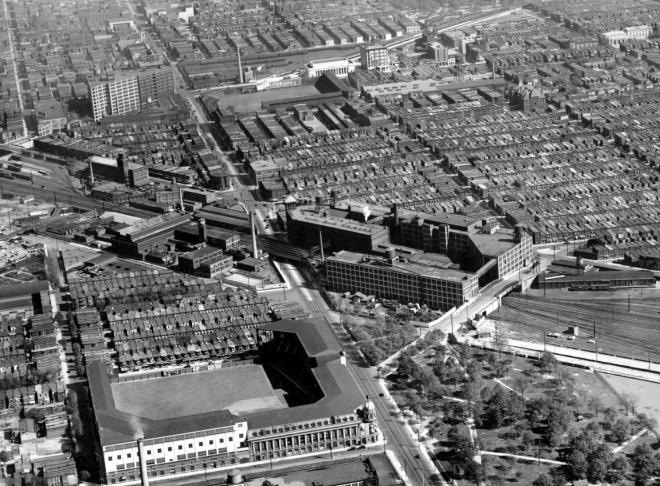 Just to save me another essay ("Major League Neighbors"), here's an aerial of the Baker Bowl (background) and Shibe Park (foreground), which were used simultaneously for about three decades (1909-1938), and were only a few blocks apart on Lehigh Avenue. Damn, those old ballparks always look so depressing in black and white. I have to think that doesn't convey the feeling of what it was like to pass a day at the park. Here's what they looked like when they were young and fresh. Here's how the parks were aligned, relative to a Google Maps image of the neighborhood today, You can enlarge the image by clicking on it. Enough of the digressions. If you love those old parks as much as I do, there is a site called BallparksofBaseball.com which is just filled with images, data and stories about them (and the newer parks as well). Check it out. I especially enjoy looking at how the parks used to fit into the city grids, and how the same blocks look today, post-stadium. We now return to our regularly scheduled program. 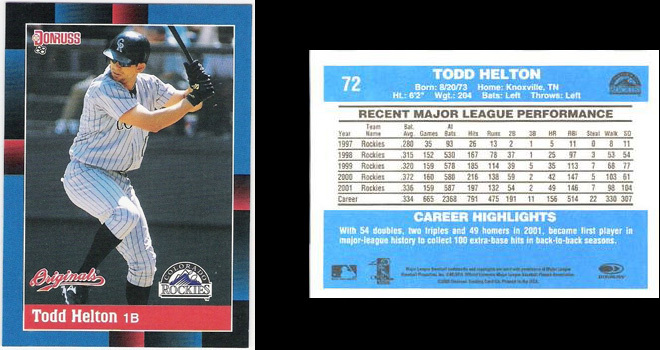 Todd Helton played his entire career for the Rockies. He was the Chuck Klein of Coors Field. Over the course of his career, he batted .345 at Coors with 32 homers per 162 games and a .607 slugging average. On the road he batted .287 with 20 homers per 162 games and a .469 slugging average. Those three elements are almost identical to Chuck Klein's lifetime road performance (.286, 20, .466). He hit 227 homers in Coors, 142 on the road throughout his career. Larry Walker's performance in Coors was even better than Helton's. He batted .381 there, with 41 homers per 162 games and a .710 slugging average. His comparable lifetime averages on the road were .278, 27, .495. Factoring out the effect of their home parks, Walker was a slightly better hitter than Klein or Helton. His lifetime home/road stats are not as dramatic as Helton's because he played in other home parks throughout his career, but overall he hit 215 homers at home, only 168 on the road. Here are two other well established sluggers with dramatic home/road splits that worked in their favor. Ron Santo: 216 at home, 126 on the road. Wrigley Field has been a tremendous hitter's park in some years, not so much in others, presumably based on the unpredictable wind direction and velocity in Chicago. 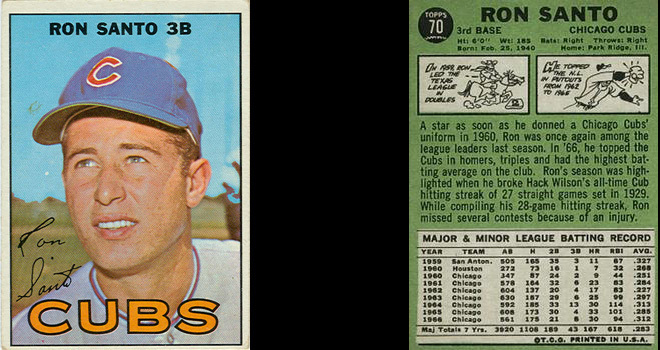 Overall, it was very beneficial to Ron Santo's career. Santo received the most dramatic benefit from Wrigley Field, but his long-time teammates, Ernie Banks and Billy Williams, also loved the "friendly confines." Banks hit 290 homers at home, only 222 on the road. Williams hit 245 at home, 181 on the road. Wrigley probably added 50-100 homers to each of their careers. Those confines seem to be friendly to batters on both sides of the box. Santo and Banks batted right-handed, while Williams swung from the port side. 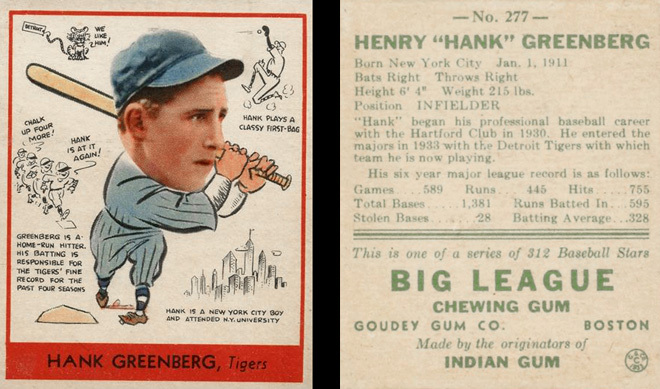 Hank Greenberg: 205 at home, 126 on the road. Greenberg absolutely owned that park in Detroit. In 1938 he hit 39 homers at home, a record which has never been broken. That's the same number Bonds hit at home when he poled 73 in 2001. McGwire hit 38 and 37 at home in his two big years. In 1937, Greenberg had 101 RBI at home, which seems eye-popping until you see the 1930 numbers for Hack Wilson, who drove in 116 runs at home that year. (That's not a typo.) Wilson's numbers are even more impressive when you consider that the man was not that much taller than Eddie Gaedel. Which players were hurt by their home parks? 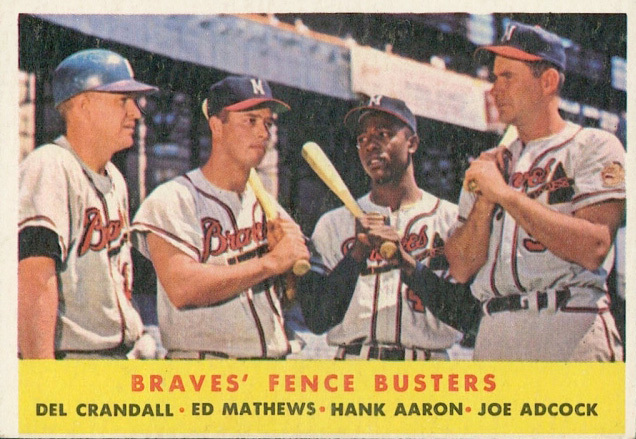 The three primary power hitters of the old Milwaukee Braves (Aaron, Adcock, Mathews) were hurt by County Stadium. All three of them are even more powerful than you think they are. I don't know the scientific explanation for it because the dimensions of the park were symmetrical and typical, and there was nothing very unusual about Milwaukee weather conditions, but the ball was just dead there, and that park really slowed down the home run hitters. Henry Aaron's career home/road breakdown doesn't reflect it, because he was able to balance off the Milwaukee years with some great home park advantages in Atlanta, but Aaron was affected substantially by having played in County Stadium. You know that Aaron never hit 50 homers in a season, thereby denying him a special place in the baseball pantheon, but he had three separate years in Milwaukee when he hit at least 25 on the road. A road total like that normally guarantees 50 for the year, but Aaron finished with 44-45-44 those years. In his twelve years with the Braves in Milwaukee he hit 185 homers in County Stadium and 213 on the road (his ratio was 10:12 when he played for the Brewers, for a composite of 195-225 at Milwaukee County Stadium), but after the Braves left Wisconsin, Aaron hit 190 at home for them and 145 on the road, so his lifetime totals just about balanced out (385-370). Ed Mathews wasn't so lucky. He played most of his career with the Milwaukee Braves, and thus finished with 238 at home, 274 on the road. In his biggest year (1953), he hit only 17 at home, but 30 on the road. In his second biggest year (1959), it was 20/26. Big Joe Adcock seems to have been affected the most of the three. He hit 137 at home, 199 on the road. During his Milwaukee years in was 104/135. Mathews was a lefty, the other two batted right-handed. The park seems to have played no favorites in that regard. 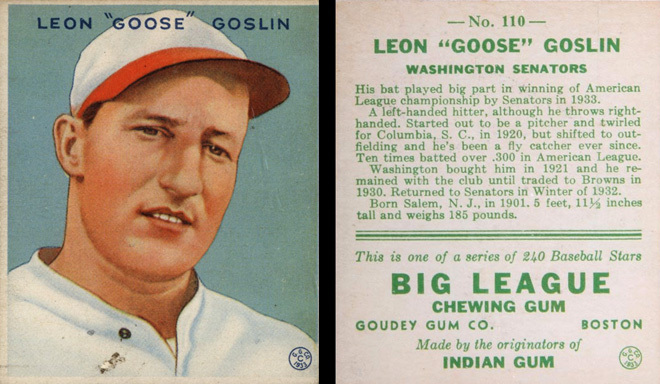 Finally there is the special case of Goose Goslin. Baseball writers and fans didn't know much about how to analyze stats back in the day, but even then they knew that the Goose was getting cooked by cavernous Griffith Stadium. It all became obvious in 1926 when Goslin hit 17 homers on the road - and zero, zilch, nada at Griffith. People started to realize that he wasn't a guy with mid-teen homer power, as he had always appeared to be, but a true power hitter capable of big numbers in the right environment. That proved to be more than theoretical when the Senators dealt him off to the St Louis Browns, and he proceeded to hit 37 homers for the year - even though he spent the first third of the season in Griffith Stadium, where he hit only three homers in 135 trips. That trade probably got the ol' Goose in the Hall of Fame. People had already known that he was an RBI machine, since he knocked in 90 or more runs thirteen times in his career, but he had never hit as many as twenty homers in any season before that one, and the fact that he finally put up a big homer number certified his credentials as a slugger. By the way, that's the same number of 90+ RBI seasons as the great Jimmy Foxx, even though the Goose could not muster even half as many homers as Double X. Goslin finished his career with more than 1600 RBI, more than Mike Schmidt, although he had only 248 homers. One wonders what kind of RBI numbers he might have accrued at the Baker Bowl. Over the course of their careers, Goose actually hit far more road homers (156) than Chuck Klein (108), but he hit only 92 at home, compared to 192 for Klein. Even that ostensibly extreme ratio has been moderated by the fact that he got to spend a few years out of Griffith Stadium in the second half of his career. In the 1920s, playing exclusively at Griffith, he averaged only three homers per year in his home park, amassing a mere 24 at home for the entire decade, as contrasted to 84 on the road.